Live multimedia performance. 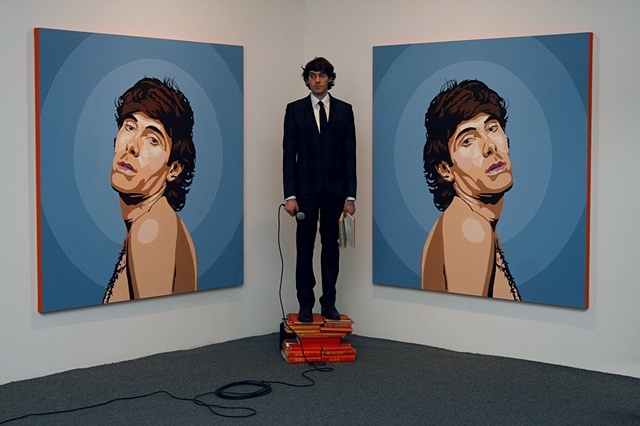 Two 72 by 72 painted panels, hung at right angles to one another, created a visually tense space in which I performed; the canvases served as faux billboard advertisements, as well as propaganda for a cult of personality. Using minimal movements and facial expressions, I acted as performative sculpture, singing live to projected video visuals and music accompaniment. Blue and orange complimentary elements were used throughout the space for visual cohesion.